This older sci-fi film works the same side of the street as such stories/films as A Sound of Thunder and to a lesser extent Looper and Predestination. Unlike the two latter films Project Almanac doesn't have any deeper underlying story or external clash between good and evil. The struggles are almost entirely internal and prosaic. It's been too long since I've read any physics texts or explanatory books but my understanding is that although faster than light travel is impossible time travel into the past may well be possible. There's some books on this I'm looking forward to reading in the near future that will hopefully explain some of this stuff in layman terms that I might more easily understand. College physics was a long time ago. The problem with time travel of any sort though is causality. If you are already here than obviously you can't go back in time and kill your grandparents before they had your parents because apparently you already failed. And everything that exists today is the result of an infinite number of decisions that were taken by many different people as well as chance. If you change any of those inputs, perhaps you don't have the same outcome. Or perhaps you can't change the outcome in your universe but do so in another universe. Perhaps there are an infinite number of universes that branch off from every possible decision made by every human who ever existed or who ever will exist. We may never know. 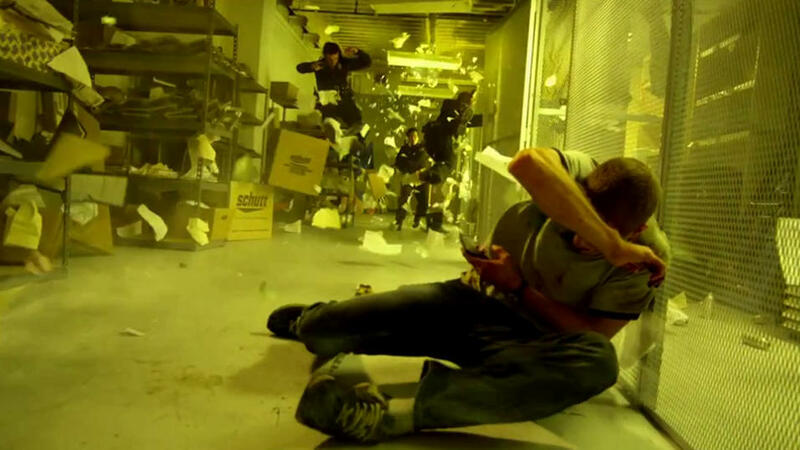 Project Almanac examines those questions. Rather than place the characters in a dystopia where government agents or hit men are the time travellers, this movie puts the time travelling protagonists in high school. In today's world high school senior and super smart inventor David Raskin (Jonny Weston) is admitted to MIT. His mother (Amy Landecker) and younger sister Christina (Virginia Gardner) are very proud. David is a real chip off the old block. His deceased father was also a scientist and inventor. Unfortunately MIT isn't offering a full scholarship, just roughly 20% of what the tuition and board is. Well that will put the damper on the party. David's mother decides that she'll sell their house and use the proceeds to pay for David's education. She'll be happy to live in a small apartment as long as her son is getting his education. Good parents are like that, aren't they? David wants to avert this. David thinks that if he can come up with some extraordinary invention or scientific breakthrough he can get a full ride to MIT. David asks Christina and his similarly science minded high school buddies Adam (Allen Evangelista) and Quinn (Sam Lerner) to help him dig through his father's belongings to try to find something he can use. In his Dad's video camera, David finds a video of his seventh birthday party. Strangely enough he also sees what looks like a current day reflection of himself in the mirror. That can't be right but there it is. After some close analysis the team of scrappy teens think that the current day David must be pushing some sort of button in the house. They find the button and then find a hidden basement cache of research, blueprints and technology created by David's and Christina's Dad. It looks like their Daddy was working on a temporal relocation device, or as you and I might call it, a time machine. Here, it might be worth mentioning that their father always made David and Christina stay out of the basement, but no one ever pays attention to those sorts of restrictions in these kinds of movies. Before too long David, being the budding genius he is, has, with the help of Adam and Quinn, created a working time machine. And with the initial unsuspecting help of David's longtime crush Jessie (Sofia Black-D'Elia), David obtains enough power in the machine to send not just inorganic material back in time a few minutes, but to send organic material back for hours or even days. As you might expect the teens initially have all sorts of relatively mundane uses for this machine that mostly involve things like winning the lottery, getting even with bullies or passing tests. David is getting close to Jessie. And Adam might have a thing for Christina. David is continuing to work to miniaturize the machine and increase the time period that the machine can send them back. But there is no such thing as a free lunch. The more time that things have to change, the more that they can change. And not always for the better. This was a fun lightweight movie for the non-scientist that might make the viewer want to dig out his old physics textbooks. I am sure that a bored physicist could point out a good ten mistakes or lies in the movie's science in the first half-hour of running time. Unfortunately I didn't care for the ending which I thought was a cop-out but YMMV. That aside there are some interesting questions raised about paradoxes, destiny and free will. However, the film raises those questions ONLY with regard to will David find true love with Jessie. There was a lot more that the film could have done with the time traveling premise and paradoxes, but I guess not every movie needs to be as serious or as grim as the other time traveling films I mentioned earlier. Okay first things first, although this is a well made and visually striking movie that is set in wartime, it is not the kind of war movie that many modern viewers have come to expect. Not by a long shot. Dunkirk is not particularly bloody. There are few German soldiers shown. There's little ground combat. There aren't any shootouts. Nobody is calling in artillery. Nobody sees his buddy/brother get shot down, yells "Those SOB's got Clive!!" and then proceeds to go over the top to wreak bloody vengeance in Spielbergian/Gibsonian approved cinematic style. So if you were looking for that above all else, and I have to say I was at least looking for some of that, then this movie may not scratch your particular itch. This movie is about the British led evacuation of Allied troops from Dunkirk in 1940. Rather than cement heroism in those who kill, this movie finds its heroes and heroines in those men and women who do their job and answer their nation's call in its time of need. Most of these people don't have guns. As one plucky boat captain tells a shell shocked soldier, "Did guns help you against that U-Boat?" It shows heroism in the ethos of self-sacrifice as RAF pilots go above and beyond the call of duty to protect their countrymen. For reasons that proved in hindsight to be utterly stupid, the Germans decided to halt just outside of Dunkirk. This may have been because the German Army Generals were worried about an Allied breakout and wanted to make certain that all escape routes were cut off. It may have been because the German Air Force Commander, Hermann Goering, worried about the Army getting too much credit, claimed that the Air Force could eliminate the British all by itself. It may have been because Hitler saw the British as a worthy Saxon enemy and wasn't keen on killing any more fellow Nordics than necessary. In any event the German Army stopped. And for three days the recently defeated British and French troops milled around on the beaches of Dunkirk. Their morale is low. They don't have any heavy weapons. When they're bombed or strafed from the air all they can do is duck, though some particularly foolhardy or indifferent soldiers shoot at the German planes with their revolvers or bolt-action rifles. 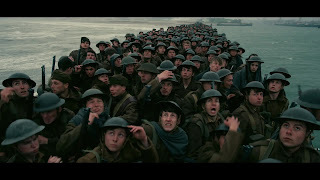 We learn that Great Britain has called upon, or requisitioned, civilian sailors to transfer the surrounded British army (and French though they are an afterthought) from Dunkirk back to England. This isn't shown from above. We see this news being passed down from the Army and Navy officers to their men. Nolan messes around with the time elements. Some of the story is non-linear. 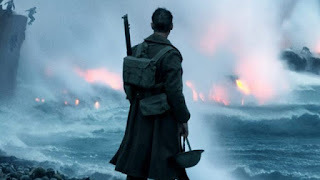 Nolan splits the movie among the three elements in which the battle was fought, air, land and sea. Although the movie lacks the gore that other directors have chosen for WW2 stories, it effectively conveys the chaos and confusion of war. Ships are torpedoed, bombed and strafed. Men drown, either by being trapped in a locked compartment as a ship capsizes, or just because they lack life jackets and/or can't swim. Spitfire pilots do their best to protect the British ships though the pilots are low on fuel. Desperate British soldiers hide out in abandoned transport vessels and wait for high tide. This movie was occasionally hard to follow because of the very thick accents but Nolan doesn't really bother to distinguish among the various soldiers and other characters in any event. 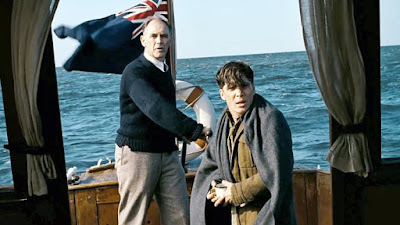 The one character who stood out for me was Mr. Dawson (Mark Rylance), a mariner who keeps the stereotypical British stiff upper lip as he takes his son and another young man who wanted to help into danger. Other actors of note include Kenneth Branagh, Tom Hardy, Cillian Murphy, and Michael Caine. This film didn't have a lot of dialogue. I mean what are beaten men who are scared, hungry, shivering, and wet going to have long conversations about. Dunkirk would have worked almost as well as a silent film. There are many long periods of near silence. If you don't normally watch war movies because gore upsets you, you can watch this movie. It is like one of those classic fifties and sixties war movies. But if you are claustrophobic or have a special fear of drowning, then maybe this isn't for you. Increasingly, some Black American actors have grumbled about British or African Black actors taking film roles based on iconic Black Americans. Doubtless some of that may be jealousy, but some of it isn't. There is definitely something to be said for certain roles that are critical to a people's or nation's storyline being filled by actors with that particular background. Dunkirk is such a film. Dunkirk was better for the fact that, at the director's insistence, all of the roles were filled by British actors. An American actor wouldn't have fit in Dunkirk just as John Boyega simply did not fit in Detroit.